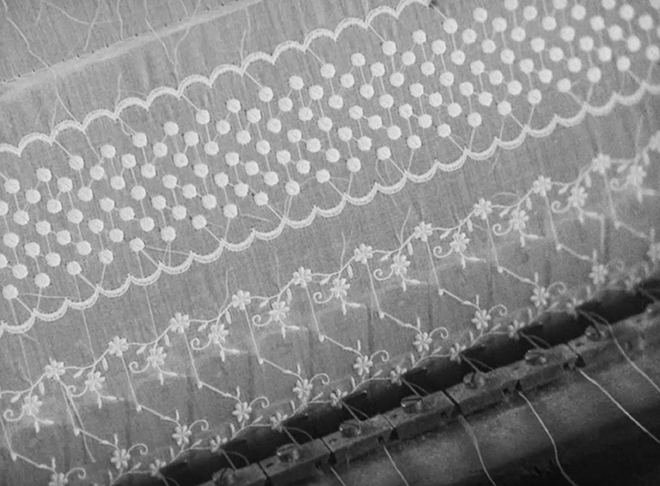 It could be argued that time is cinema’s very substance, it makes itself felt even where movement ceases to exist. As the Russian film director Andrei Tarkovsky once put it, ‘one cannot conceive of a cinematic work with no sense of time passing through the shot, but one can easily imagine a film with no actors, music, décor, or even editing’. For fashion too, time is essential – without time, fashion would lose its meaning. With its fleeting temporality, fashion has become the most powerful emblem of novelty and zeitgeist while also being a vital marker of history. 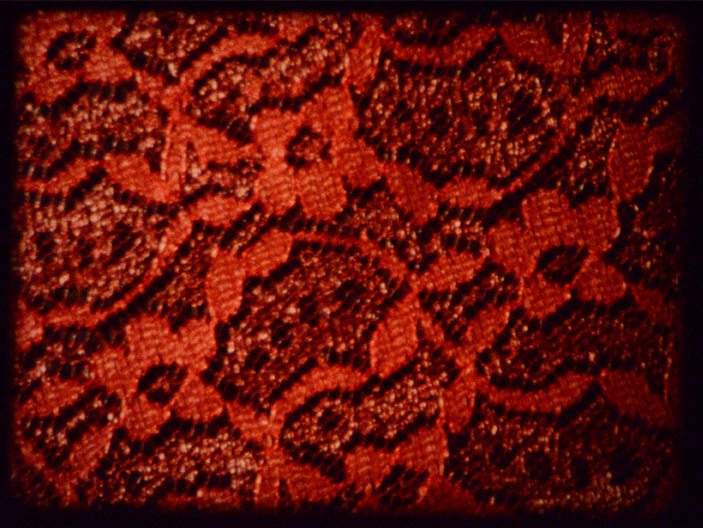 The exhibition presents a selection of films offering contrasting perspectives on fashion, time and the moving image – from recordings of the manufacturing process to explorations of chronology, metamorphosis and fantasy, to moments when dress and artifice come to embody the texture of time. Directed by Émile Cohl and Étienne Arnaud / Gaumont. France, 1909. 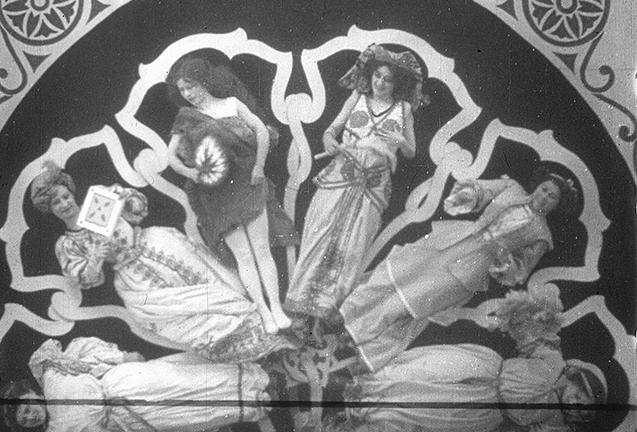 As in its precursor, Georges Méliès’s Le Merveilleux Éventail vivant (The Wonderful Living Fan, 1904), the fan in Cohl and Arnaud’s film is treated at once as a decorative object of coquetry and a site for multiple costume change. 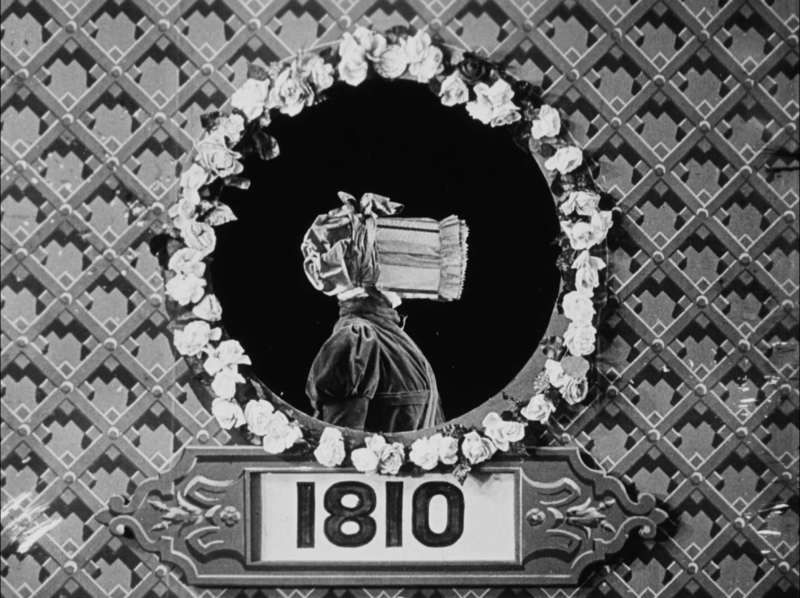 But, departing from Méliès’s film, the open fan here becomes a blank film screen on which to project different ‘historical’ vignettes with archetypal women, from Eve, Sappho and Cleopatra to modern-day Parisienne. 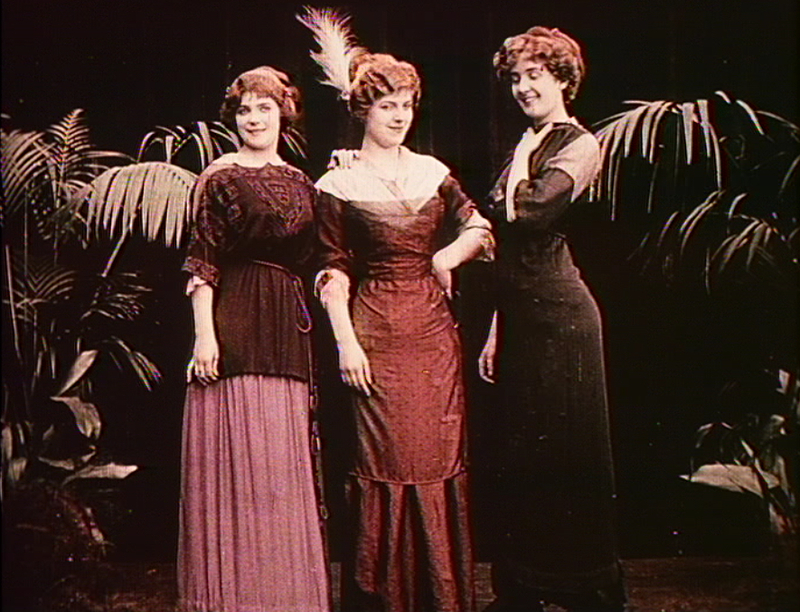 ‘Costume across the ages’ was a popular genre in silent cinema around 1910, itself derived from the popular interest in historical costume exhibitions and theatrical pageants. A perfect excuse to reanimate picturesque costumes, these tourist-like excursions into fashion’s bygone days present history as a highly compressed succession of the most emblematic styles and typically end with a triumphant – though sometimes humorous – apotheosis in modern day dress. Directed by Émile Cohl / Gaumont. France, 1909. Another example of the ‘costume across the ages’ genre, in which historical hats are paraded on living mannequins standing on a mechanically revolving turntable. Each turn is a cue for a historical skip forward, manifested in a change of a hat. Directed by Jodie Mack. UK, 2012. Directed by Cindy Sherman. USA, 1975. Made in 1975, before her famous Film Stills series, Cindy Sherman’s kooky animation Doll Clothes anticipates the artist’s major theme of self-fashioning. 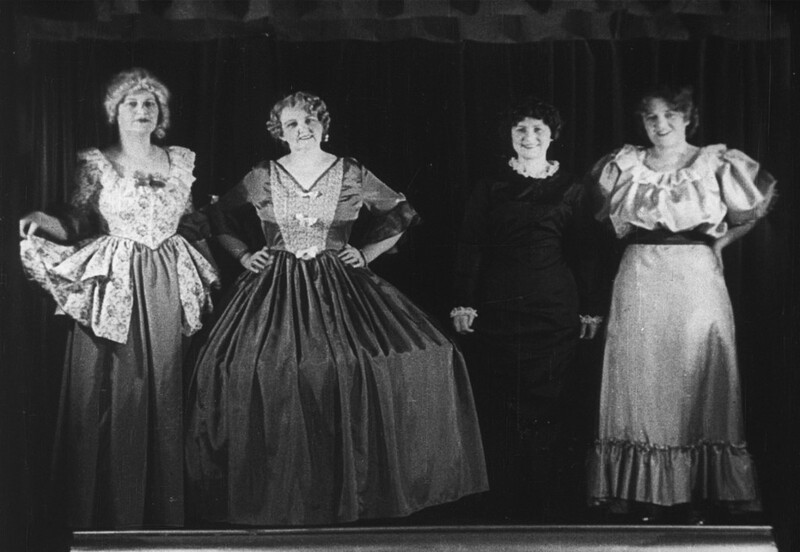 Sherman plays a paper doll who comes to life in order to exercise her freedom of choice over a selection of cut-out outfits – until a hand from above intervenes. Directed by John Maybury. UK, 1998. Directed by Thomas Napper for Vexed Generation. UK, 1999. Wrap Liberation was made in conjunction with an eponymous clothing collection designed in 1999 by Vexed Generation (Adam Thorpe and Joe Hunter). Capturing the designers’ concerns with political confinement, homelessness and mental health, the film (made in a male and a female version) features a dancer hung upside down, attempting to wriggle out of a straitjacket wrap. The oppressive tone of the performance itself, as well as the background of a large ticking clock, recall Tony Curtis’s re-imagining of a Houdini magic act in his 1953 film, in which physical and temporal constraints are ostensibly – and tragically – intertwined. Directed by Werner Dressler. Switzerland, 1939. Directed by Nick Knight, styled by Simon Foxton and Jonathan Kaye. UK, 2001. Nick Knight’s film borrows its title from Andy Warhol’s 1963 experimental film, riffing on the artist’s fascination with prolonged exposure of largely unmoving subjects. One of the earliest of SHOWstudio’s productions, Knight’s Sleep, however, is/was not only a film but also a film-based performance. Over several hours during a December night in 2001, the image-maker orchestrated a ‘live photo shoot’ in which his website streamed video ‘portraits’ of nine models captured by webcams while asleep in their hotel rooms. 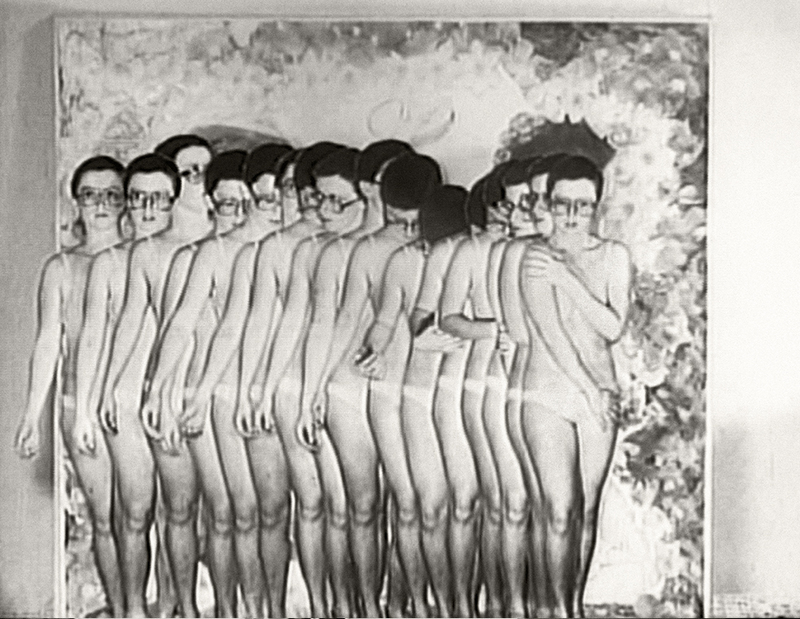 To those watching live, the models’ bodies appeared virtually still, moving only every so often to adjust positions. Nine short film segments were then created afterwards and combined, using a time-lapse effect to re-introduce movement and action into the perceived stillness. The resulting film shifts the focus away from the surveillance and voyeurism of the live streaming, towards the lyrically mutating forms of the models’ flimsy dresses and hair. Directed by Lernert & Sander. Netherlands, 2013. Lernert & Sander’s Last Season is a pithy commentary on the fleetingness of fashion, and above all, its obsolescence and death. Walter Benjamin, who was greatly preoccupied with fashion’s relation to death, wrote in The Arcades Project that yesterday’s fashions are ‘the greatest anti-aphrodisiac imaginable’ – to him there was something both aesthetically troubling and highly charged about the fashions that had just passed. 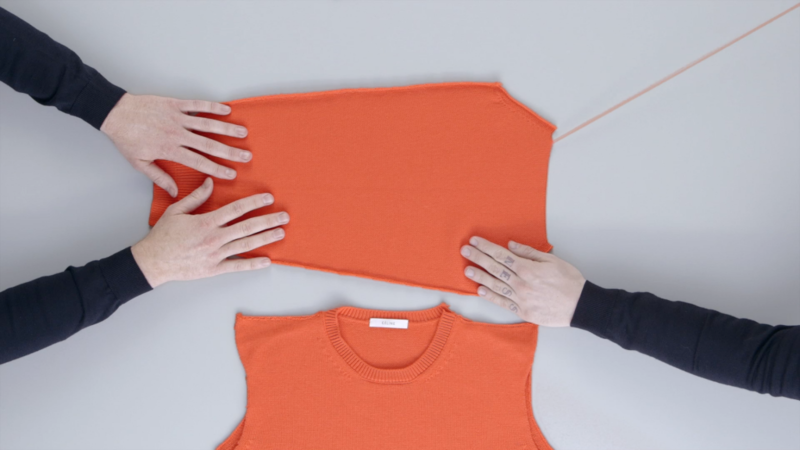 Commissioned by shop owner Kiki Niesten, Lernert & Sander’s film inverts the mythical formula of creation from thin air, creating instead ‘nothing out of something’, and doing so with an obvious pleasure. Fashion’s death here is a necessary and uncompromising demise, and the time of its un-making is conveyed literally, through a ritual of unravelling knitwear by super-brands such as Prada and Celine. The exhibition is curated by Marketa Uhlirova and Tom Gunning, with exhibition design by Caitlin Storrie and Marion Saurel. With grateful thanks to all lenders: British Artists’ Film & Video Study Collection, Cinémathèque Suisse, Gaumont Pathé Archives, Jody Mack, John Maybury, Lernert & Sander, Cindy Sherman / Metro Pictures, Svenska Filminstitutet, SHOWstudio and Vexed Design. Thanks also to Andrew Baker, Craig Barnes, Daniel Copley, Arya Fathi and Alex Schady.